Campsis radicans or trumpet creeper, is a quick growing, perennial vine that has invasive tendencies. Despite its reputation, campsis radicans does have redeeming qualities such as the bright, orangey-red blooms the vine produces in summer. The 3-inch flowers complement deep green foliage that climbs any structure within reach. 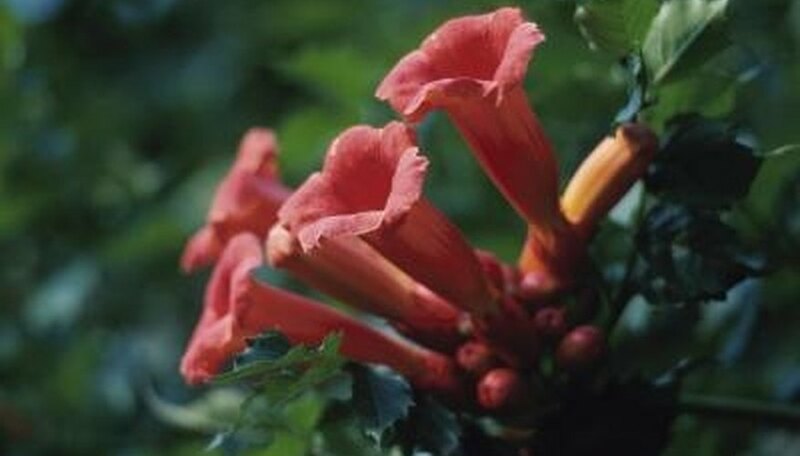 Campsis radicans thrives when planted in U.S. Department of Agriculture plant hardiness zones 4 through 10, growing to heights of 40 feet with a 10-foot spread. Prepare a planting site that receives full sun during the day. Select a site that contains well-drained soil with a pH of 3.7 to 6.8. If you do not know the pH of your soil, test it with a soil testing kit purchased from a garden center. Loosen the soil by turning it over with a pitchfork and amend if necessary. Lime will raise a pH below 3.7 and peat moss will lower a pH above 6.8. The manufacturer's label on the amendment provides application methods and allocation amounts. Bury the root-balls of the campsis radican seedlings in planting holes that measure 3 inches deep, spaced approximately 5 feet apart. Pat the soil around each seedling to remove air pockets. Water-in the campsis radican after planting. Soak the soil to a depth of 1 inch with a garden hose. Keep the soil moist to the 1 inch depth throughout the growing season with supplemental watering once a week in the absence of rain. Spread a layer of bark chips around the campsis radican vines to suppress weeds. Weeds will compete with the vines for water, a situation that can inhibit growth. A 3- to 4-inch layer of mulch is all that is necessary to keep the weeds at bay. Campsis radicans will die-back on their own in the fall and reemerge in the winter. Due to their invasive nature, campsis radicans requires pruning in the winter or spring before new growth appears. A heavy pruning with a pair of pruning shears will keep the plant neat and tidy. Avoid pruning more than one-third of the vine in a single pruning.